Stephanie Corley will play the titular role of Cole Porter’s Kiss Me, Kate, when the classic musical comedy plays a two-week run at the London Coliseum in June. Corley, who most recently played Tina in Jonathan Dove’s Flight at Scottish Opera, will play Lilli Vanessi/Kate in Opera North’s production. She is joined by Zoë Rainey (An American In Paris, West End) in the role of Lois Lane/Bianca, Alan Burkitt as Bill Calhoun/Lucentio (having played the role for Welsh National Opera in 2016), and Joseph Shovelton and John Savournin, reprising their scene-stealing turns as dopey mobsters. The cast will also star Aiesha Pease as Hattie; Stephane Anelli as Paul; James Hayes as Harry Trevor/Baptista; Jack Wilcox as Hortensio; and Malcolm Ridley as Harrison Howell. 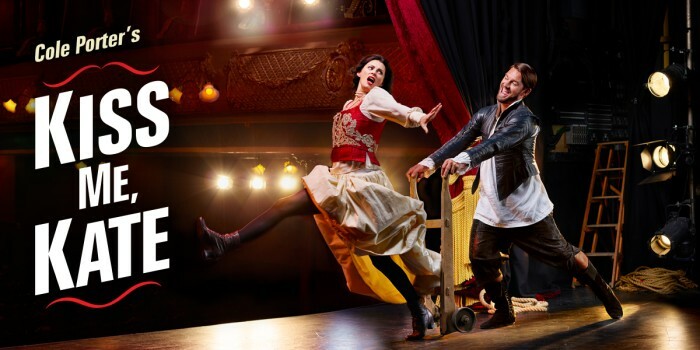 Playing in the West End as part of a national tour, Kiss Me, Kate is Cole Porter’s riotously inventive homage to the sparkling wit of Shakespeare – and an infectiously joyous celebration of the madness of working in theatre. On the opening night of a musical version of The Taming of the Shrew in 1940s Baltimore, the tempestuous love lives of actor-manager Fred Graham and his leading lady (and ex-wife) Lilli Vanessi are set to collide. Throw in Fred’s current paramour Lois Lane and her gambler boyfriend Bill – plus a couple of gun-toting gangsters who somehow get caught up in the show – and the stage is set for a funny and farcical battle of the sexes! Kiss Me, Kate plays at the London Coliseum from 20 June to 30 June 2018. Book your Kiss Me, Kate tickets today!